There was a time when a sea of red letters announcing bandas and political meetings littered the white washed walls of Kathmandu. 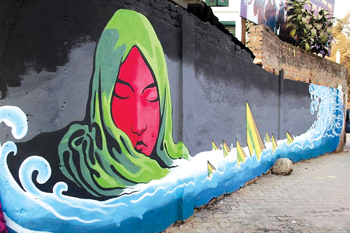 But thanks to the painstaking efforts of Nepali and international artists, the otherwise dull streets of the Valley are getting a festive facelift and residents have reason to catch their breath and linger over the beautiful images. 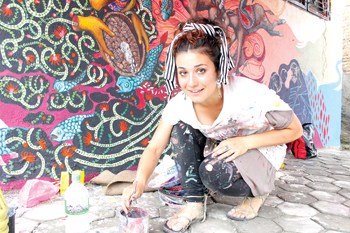 In 2008 French urban artist nicknamed Invader began painting walls in Kathmandu. While his work didn’t generate much buzz, it provided inspiration for others to paint the town red. In the past year, 12 international muralists including popular German street artist duo, Herakut, and 25 local artists, from Kolor Kathmandu have painted 25 murals in Baluwatar, Sankhamul, Bhotahiti, Jawalakhel, and other parts of town. Their aim: to create 75 murals to represent each district in the country. The campaign is supported by Netherlands’ Prince Clause Fund and Pashupati Paints is providing the group with 800 litres of paint. LET’S PAINT: Canadian artist Danae Brisonnet of the same group works on her piece. 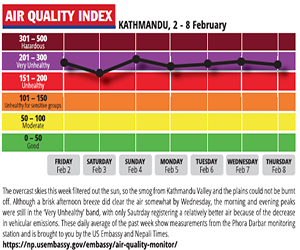 “Kathmandu’s residents have been treated to visual pollution all their lives. I wanted to change this by making our streets more appealing through mural art,” says Yuki Poudel, the 27-year-old project director who was inspired by street art in Philadelphia. Similarly painters and graffiti artists from Artudio, a centre for visual arts, and Art Lab have been by livening up the city walls with their brushes while raising awareness on issues ranging from gender violence, to reproductive health to child abuse at the same time.“By turning public spaces into public galleries, we want to instill positivity in people,” explains Roman Bhattarai, program director of Artlab, a group based in the Valley which is involved in street-art, social-projects, designing event sets, and creating t-shirts. A Kolor Kathmandu mural representing Doti district seen in Kupandol. However, as election date draws closer, murals around Kathmandu are in danger of once again being outdone by political sloganeering. With paintbrushes in hand, artists are gearing up for a tough battle ahead. The biggest losers from the wanton slaughter that the Maoists have unleashed on the country will be the Maoists themselves. The best way to navigate the market for success.